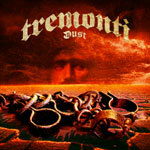 Dust and the last record Cauterize were recorded at the same time in the closing months of 2014 and according to Mark Tremonti himself the 20 songs were split between the 2 pieces of music to get 2 equally good efforts out. As with most decisions in the region of this one, it's of course a matter of taste which songs would end up on which album eventually, but to me personally Dust is definitely the greatest one of the records in question. It feels pretty ridiculous to try to write another review when the lion's share of the most important information already was written in the review for Cauterize last year. I mean, the albums are demonstrably very similar to each other in terms of balance between heavy and lighter and of course in the performance too. It's not like his voice has deteriorated either just because these songs have been in a vault, waiting to be put out, for another 11 months or so. If you feel like checking out the YouTube clip below, I must point out that the title track, even if it is a nice song indeed, is just one of a few more mellow moments present on this record. Most of the time Dust is in fact quite heavy with a massive amount of attacking riffs that's hitting the ears over and over again. Mark Tremonti's solo efforts never seem to come out disappointing and we will see later this year if Alter Bridge's new record will be able to come out equally strong as this one.